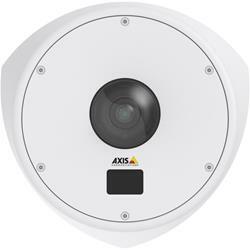 AXIS Q8414-LVS Network Camera features vandal-resistant stainless steel anti-ligature casing and built-in invisible IR LED for high quality indoor video surveillance even in complete darkness. AXIS Q8414-LVS is extremely impact resistant, support-ing the IK10+50 joules rating as well as the IP66/NEMA 4X rating for water resistance. Easy and safe to clean with a water hose, soapy water or other multi-purpose cleaning agents.